The day of Aunt Cecil's funeral was one where the weather was so icy, we couldn't travel across state to go to it. Kirk was very fond of his Great Aunt Cecil. She spent the last few years of her life in a nursing home and when we would go to Grand Rapids to see his parents, we would try to stop in and spend time with her. We would play scrabble with her or just sit and talk. She was a very nice, kind and lovely woman. Cecil A. Dollaway was born to Willis G. and Francis (Denny) Dollaway on 17 May 1899 near Lowell, Kent, Michigan. She married Rolland Jessup on 6 August 1920 in Lowell, Kent, Michigan. Rolland and Cecil never had any children. Cecil died 21 January 1982 in Grand Rapids, Kent, Michigan and is buried in Blythefield Memory Gardens, Rockford, Kent, Michigan. 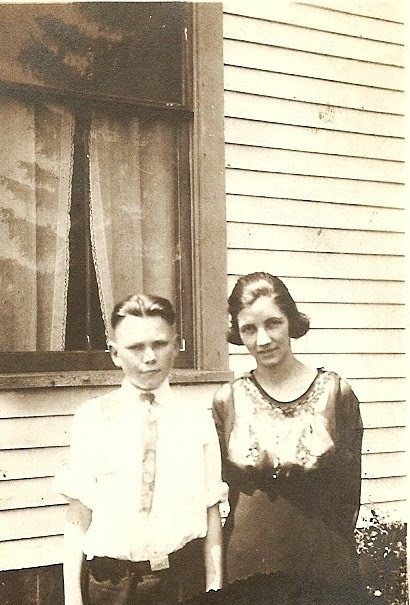 L-R: Clarence Dollaway and his sister, Cecil Dollaway. Date unknown.